How easy is it to lose a horse ? This painting by talented artist Bev Doolittle features a number of pinto horses that are the same colour as their background. While it doesn't represent the level of camouflage a real horse is likely to be capable of it does however provide a stunning optical illusion. How many horses can you see in the painting ? 5 horses I think....pretty neat this one. this is so cool wow. 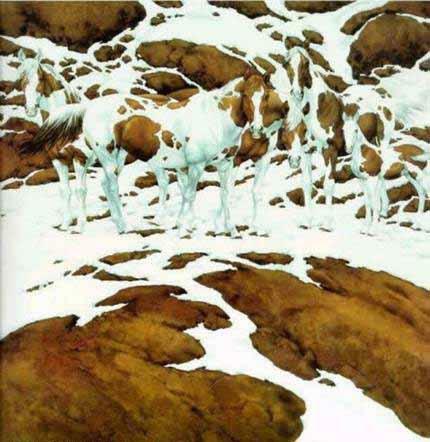 I have seen this one before and I have been told there are 7 horses. However, I can only see 6. Frustrating bcs I wanna see the 7th. I can see only 5.
i c 5 of them love this pic!so cute! 5, easy peasy, lemony sqeezy!!! i agree with every1 that says 5!!! actually there are five you can tell this by counting the number of legs you see in the picture and dividing that by four.